Ladies and gentlemen, start your engines: Ace Cafe Orlando, the first North American location of the celebrated London-based cafe, makes its world debut on Friday, May 19. Guests are invited to kick-start the grand opening weekend of the all-new, full-throttle, rock ‘n roll destination Ace Cafe with a cuppa coffee and tea when the Ace officially opens its doors to the public on Friday at 7:00 a.m., then stay to enjoy an action-packed weekend of festivities at the 35,000-square-foot motor-centric dining, entertainment and retail destination. 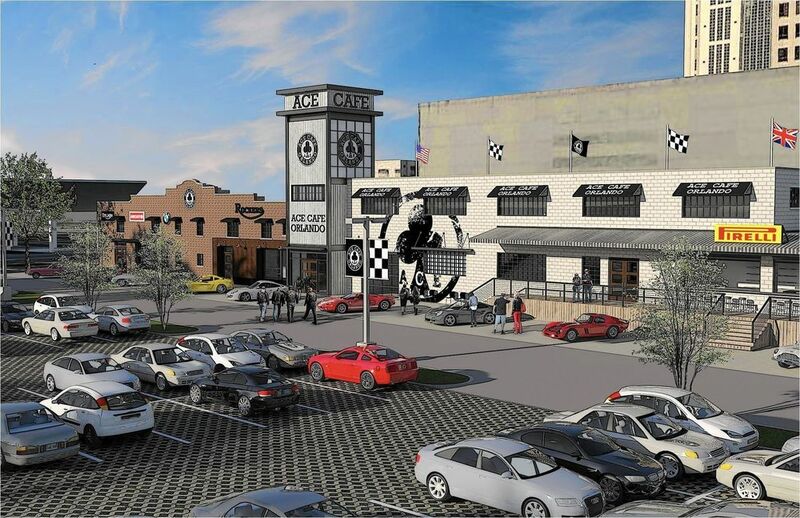 North America’s newest home for all who share the passion for speed, thrills and rock ‘n roll is waiving the green flag, signaling that it’s “go time” for Central Floridians and guests from around the globe to celebrate the heritage and history of the most famous cafe on the planet. All three days of grand opening weekend will feature cool cars and hot bikes, live rock ‘n roll inside and outside both day and night, a BMW RnineT Racer motorcycle raffle benefiting Arnold Palmer Hospital for Children (APCH), live demonstrations by three world- famous artists, onsite activities and brand partner merchandise (while supplies last), and a free Friday night concert by Rockin’ Jason D. Williams – direct from Memphis, about whom Rolling Stone magazine says “There hasn’t been raw rockabilly this solid since Jerry Lee Lewis, himself.” A snapshot of Ace Cafe Orlando’s grand opening weekend celebration is listed below; visit AceCafeUSA.com to stay up-to-date on the Ace’s grand opening happenings. 7 a.m. – Julius Meinl coffee – direct from Vienna; tea, and grab ‘n go breakfast bagels, muffins, burritos, croissants, and cinnamon rolls also available. Ace Cafe’s Cool Cars for Kids to benefit the Arnold Palmer Hospital for Children. For a $15 donation per car, participants can be a part of the opening weekend car show and receive a limited-edition Ace Cafe grand opening t-shirt. 10 a.m. – Free activities in the car park starting with a variety of local partners and vendors engaging Ace fans until 5:00 p.m.
4 p.m. – Live music starts outside, with live rock ‘n roll into the night. 10 a.m. – Free activities in the car park starting, with a variety of local partners and vendors engaging motor fans until 5pm.